Our research is constantly aiming to integrate environment with information technology, crossing disciplinary borders among the natural and commercial sciences and incorporating stakeholders from industries, politics, and society. Spatial analysis is the crux of GIS because it includes all of the transformations, manipulations, and methods that can be applied to geographic data to add value to them, to support decisions, and to reveal patterns and anomalies that are not immediately obvious. UIZ research team is aware of the GIS’s potential and its usefulness in the spatial data analysis. The GIS that is developed by UIZ is getting an extremely powerful tool in in-house research, where UIZ specialists use this software to give their own contribution in this intersection. The target is to create a method for spatial data analysis that whose results quality won’t be questioned, not even the limitations. The limitless software combined with the human skills can be an unquestionable tool for spatial data analysis, worldwide. So far, our research team is on a right way. 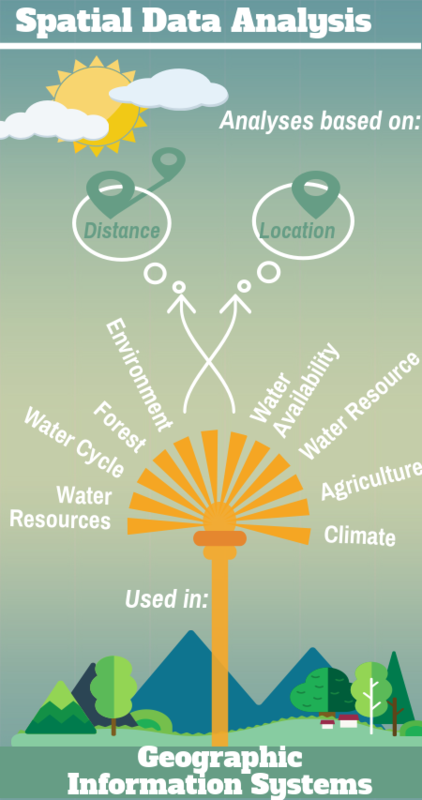 The areas where this tool can be used and where spatial data analysis is necessary are uncountable, but they can be divided into 4 themes for analysis: a) Forest, Agriculture, and Environment; b) Water Availability, Quality, Accessibility, and Monitoring; c) Water Cycle and Climate; d) Integrated Water Resource Management. All of this methods are improved with human intelligence, with the human power of our company- UIZ geologists, environment experts, and data analysts. These research and development themes, aligned with the human skills and integrated into many projects do not only coexist, they are interlinked. For more detailed information about our web-based GIS software,click here!